During the summer months, the Red Cross experiences a drastic decline in new donors. Nationwide, about one-third fewer new donors came out to give last summer than during the rest of the year. Additionally, many schools where blood drives are held – and where new donors give – are not in session, and current donors often delay giving due to summer vacation plans. What a great way for our facilities to help this shortage than by hosting a blood drive. Generations at Elmwood Park and Generations at Regency in conjunction with the American Red Cross (seen above), were very honored to host community blood donation drives in July and August. They had an outstanding turnout with many members of the community, family, staff and friends in attendance to donate. At each facility donors were greeted by staff and given the required paperwork and educational materials regarding blood donation. As they sat in our waiting area, they chatted among themselves about their reasoning for donating blood. At both facilities the staff rolled up their sleeves and donated to show their support. At Elmwood Park-retired Assistant Administrator Barb swung by and donated as well! 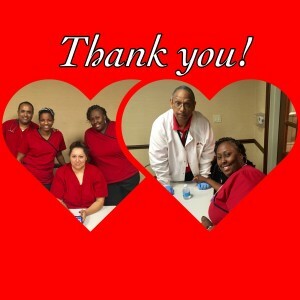 After donors gave blood they relaxed and ate a variety of snacks such as juice, cookies, pretzels and raisins. Eating or drinking foods with sugar helps to keep the donor’s glucose levels up and feel energized after their donation. These two blood drives could not been possible without the help of staff, the American Red Cross and most importantly the donors. A heartfelt thank you goes out to everyone who attended.